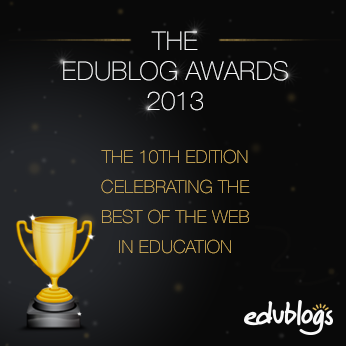 “Edublogger Awards” is an annual popular vote for online technologies. I find the Edublog site a valid and reliable source for good educational links in a variety of categories. I am honored to have been nominated in the past and continue to support the site by spreading the news, I use it as a resource when providing professional development in almost any area. I would like to see some new categories like: Best use of an online game for Teaching and Learning and Best Educational Machinima. Here are my picks, with a brief description, for the 2013 Edublog Award categories, and for my categories. I encourage you to check them out as a place where you can learn something or be exposed to a new idea that is useful as you teach and learn. Best individual blog – Educating Lotus A blog about virtual learning spaces and beautiful places. This Blog contains reflective and researched information on virtual environments and games. Best group blog – Google+ Inevitable Betrayal – This thriving Educators’s gaming community shares information, plans events, and celebrates on the Google+ site. Best new blog – Serendipitous Synchronicity, an Inquiry Into Imaginary Instantiations. This new blog (started in January 2013) focuses on research and cross-cultural communication and collaboration using digital game-based learning. Best class blog – Techy Owls , This class blog moved from last year’s closed site on blogger and provides information from varying perspectives on the topic of games in education with a current focus on Minecraft. It’s a little new but looks like great potential for sharing on topic of Minecraft and More. Best ed tech / resource sharing blog – Tube Teaching, Educational Video Production, YouTube, and Online Video – Tube Teaching provides technical information on creating and using interactive video, screen casting, and youtube tutorials for teaching and learning. Best teacher blog Islands of Enlightenment, this educator blog focuses on the teaching of history through virtual environments. The blog contains text, pictures and video to provide visitors a view into teacher created 3-D environments. Best library / librarian blog – Electronsandink.blogspot.com, A Media Coordinator in an elementary school writes about her reflections and the technology tools she uses. Most influential blog post of the year – “Night Predators” and Minecraft – a philosophy instructor writes about “fear of the dark”. Best individual tweeter – Games MOOC @proximalzone – The tweeter provides regular and informative tweets related to game-based learning, immersive environments, machinima, analytics and more, as well as conducting regular tweet-chats to facilitate the conversation among others. Best twitter hashtag – #Gamemooc – The hashtag is used for weekly tweet chats focused on game-based learning and immersive environments. Some of the topics have included, Flow and Fiero, ARGs, Minecraft, Mobile games, Machinima, Coding, Analytics, and CCSS alignment. Best free web tool – Google Hangout – Google Hangout is a free and easy way to meet with colleagues, share screens for demonstrating, coaching, and collaborating, and broadcast to a wider audience. Best educational use of audio / video / visual / podcast – Inevitable Instructors – The Inevitable Instructor series is comprised on 30 minute to 2 hour recorded sessions helping educators to understand gaming and their place in teaching and learning. The effort includes working with educators in multiple time-zones, evidence of educators grasping 21st Century teaching, learning and working principles. Best educational wiki – http://minecraft.gamepedia.com/Minecraft_Wiki, this wiki has extensive information on the use of mine craft and is particularly useful to the newcomer. Best open PD / unconference / webinar series – Inevitable Instructors – The Inevitable Instructor series is comprised on 30 minute to 2 hour recorded sessions helping educators to understand gaming and their place in teaching and learning. The effort includes working with educators in multiple time-zones, evidence of educators grasping 21st Century teaching, learning and working principles. Best educational use of a social network – Inevitable Betrayal’s Google + Community – The International IB Educator’s Guild has made wonderful use of the Google + Community social network. Members post daily on game-based learning, research and teaching topics. Pictures, screen-shares, machinima, links and events are all posted and help to bring an international group of educators together. Lifetime Achievement – I Live In Science Land, This blog dates back to 2008 with a range between 2 and 40 posts per month. The information covers highly technical topics like how to set up an educational virtual world on your own server or “Sim on a Stick” to concrete educational tips related mostly to teaching of science to just fun thoughts and reflections on teaching and learning in the virtual world. Best use of an Online Game – Arbitrage – The site shows some of the work done by Community College students and their instructor as they learn principles of economics and accounting through the Auction House in World of Warcraft. Lotus, Thanks. There are several blogs on this topic that I subscribe to, yours is one of them and I must say one that is very well researched and thought out. Hey, Grid! Thank you for the two nominations! I nominated you in several categories too, as you’ll see once I get around to posting them. Mutual admiration is so very cool! And it won’t surprise you, since we’re inevitably both “Betrayers,” that we have some of the same nominations. Hmm, this would be a good time to write my Edublogger post.